Rice is being grown in Hong Kong again for the first time in decades. Some experts note that aside from its cultural function, homegrown rice may help revive local agriculture. On a Sunday afternoon, late in October, a group of people toting backpacks could be seen wandering around Lam Chuen's farm: city dwellers on a kind of back-to-the-land outing offering polite interest, but not having a clue what they were seeing. "What do they know about farming? Nothing," Lam laughed. City folk who trekked all the way from downtown, an hour-and-a-half away, wouldn't know it was the peak of season for the rice crops. Hong Kong has two annual seasons but October is "the one". It doesn't matter that these city folk don't know farming. Lam, a robust 82 year old, is glad for the company. Lam's paddies lie scattered among 58-hectares of Long Valley, in the Ho Sheung Heung district of the northern New Territories. One of the men on the tour caught sight of the rice at last. "When I was young I loved catching frogs in the rice fields. Catch them for my mom," said the man standing by the field, arms crossed. He grew up in Yuen Long. About five decades ago there were lots of rice fields, he said. The stirring of boyhood memories seemed to revive a long dormant spirit. "I used slices of chicken to catch frogs. They're the best," said the man. "The best season is July and August. When you catch a frog, you must grab its waist - using your fingers like chopsticks. You can't grab their legs - they would just pee on you and flee," he said animatedly, posing his fingers like chopsticks. Lam laughed. "Yup. I used a torch," he said, nodding. "You throw the light on them, and they cover their eyes with their front legs. That's when you catch them." "What? Seriously? Like this?" asked a young woman, covering her eyes with her hands. "Yup. They do that," Lam replied. "Frogs love paddy rice fields. They dig holes in the field and pick up loose bits of grain. Conversation like this always adds a sprinkle of fun to Lam's daily farm life. A few years ago, Lam was invited by the Conservancy Association to join a government-funded wetland conservation project. People took notice. Even his son and daughter visit more frequently. They bring their friends and say, "Look at the beautiful rice my dad grows." They had never seen rice growing. "Look at these handsome boys," said Lam, standing at one part of the field, holding a handful of rice still wrapped in husks and appearing particularly golden. Lam had never really mapped out a plan to grow rice. "Growing rice is laborious work," he said. "Now and again it rains, and the rice will sprout. If it doesn't rain then the birds eat the plants," said Lam. "It's funny. One of our reasons for growing rice is to feed the birds. The yellow-breasted bunting is dying off dramatically, worldwide," explained Katie Chik Hiu-lai, conservation manager of the association. "We saw that their numbers started to recover after be we began growing rice. Then the birds can't eat all the rice, so we thought we could sell the surplus. The income goes to the farmers," Chik said. Currently there are about 80,000 square feet of paddy rice fields in 13 plots in Long Valley. Five farmers are engaged in the project, while members of the organization volunteer to transplant seedlings or reap rice. The paddy rice fields now produce two tonnes of rice every year - about 60 to 70 percent are sold for human consumption - not through mass market, but through the network of the organization. For reference, the average rice consumption of Hong Kong people is about 48 kilogram every year. The average monthly import of rice into Hong Kong is about 27,000 tonnes, according to the Trade and Industry Department. "Our priority is still feeding the birds - we don't harvest all the rice but it isn't impossible that one day rice could provide a stable income for some farmers and a sustainable way at least, for the nearby community. Right now, the demand of the rice we grow is increasing," said Chik. Nevertheless, it is still too early to say whether the homegrown rice could be sold locally on the mass market, Chik said. Homegrown rice disappeared in Hong Kong for such a long time, farmers don't even know where to sell rice. Nor do they dare to risk mass producing rice that's grown organically and is much more costly. It's being sold at HK$68 per kilogram. In comparison, the same price would buy about four kilograms of Thai rice at the supermarket. Growing vegetables would be a much safer bet for the farmers - there could be 8-10 harvests growing vegetables every year. There are only two harvests for rice. Long Valley is neither the first nor the only place that grows rice. When the story spread that farmers were growing rice again in Long Valley, farmers in other parts of the New Territories started growing rice again. "The recent trend does seem to show a revival of homegrown rice," said Lam Chiu-ying, adjunct professor of the Department of Geography and Resource Management at The Chinese University of Hong Kong. There are people who remember that the long-grain rice grown in Yuen Long was famous about four or five decades ago. They say Yuen Long rice could even be exported and consumed by overseas Chinese, and that only the riches could afford the rice grown here now. "The Yuen Long rice was longer. I had it when I was younger and it did taste different - the texture and the flavor," recalled professor Lam. In the 1960s and 1970s, mountain water was intercepted and used for drinking water as urbanization began accelerating. 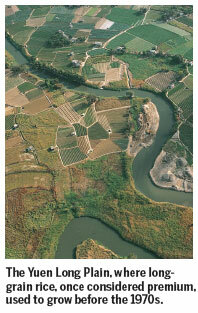 Irrigation of farmland was affected, says Professor Lam. The older generation of farmers migrated overseas. The younger ones abandoned the countryside to find jobs in urban areas, leading to dramatic decrease of workforce on farmland. By the end of the 1960s, homegrown rice completely disappeared. After China embarked on the Reform and Opening-up Policy, the supply of imported rice became much more stable, Professor Lam noted. Transportation became so convenient that the stock reserve of imported rice decreased to the amount enough for Hong Kong people to consume for 15 days, according to the Trade and Industry Department, compared with about three months a few decades ago. The call for reviving homegrown rice still sounds far-fetched for some. The per capita rice consumption in Asia is declining since the 1990s, according to the International Rice Research Institute. In Hong Kong, per capita rice consumption has also declined owing to changing diet. Professor Lam, however, insisted that Hong Kong should maintain a certain amount of homegrown rice. He cited the estimation of United Nations Food and Agriculture Organization that global food supply will fall short in the next 10 years, owing to climate change, population increase and the shrinking supply of freshwater. Growing rice at home should be a part of the effort to develop local agriculture and that should be taken as a strategic precaution for any natural disaster that cannot be predicted, professor Lam said. Much quoted is the fact that more and more highly urbanized city worldwide, New York, Paris, Beijing and Shanghai all have local agriculture. "We visited Chengdu (capital city of Sichuan province) a while ago and the city insisted a certain level of local rice provision, because the local authority realized that a supply link that relies on long-distance transportation is fragile," said Professor Lam. "Homegrown rice is considered as a source of supply that is 'under control'," he added. Homegrown rice will also serve a wide range of purposes - education, culture heritage and countryside lifestyle. Lam, who is in the board of directors of the Hong Kong Countryside Foundation, said the foundation has just rented about 200,000 square feet of farmland in the New Territories, which is planned mainly for paddy rice. It's all about preserving and reviving traditional culture - before Hakka people came to Hong Kong at the end of Ming Dynasty and started agriculture here. The conservative and hardworking Hakka people settled and grew rice here, sustaining themselves and established their own lifestyle in the countryside, and formed the groundwork of the city's modern development. 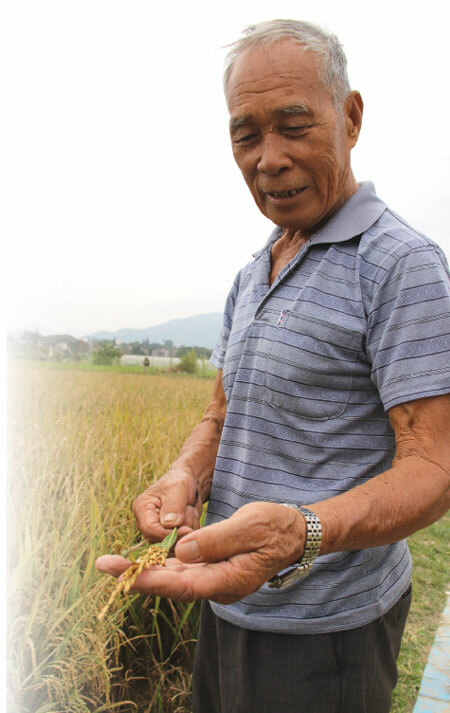 "It has got to be paddy rice - it is the soul of agriculture in Hong Kong," he said. "Look at these handsome boys," said Lam Chuen, who grows paddy rice in Long Valley. Hong Kong has not had homegrown rice for more than four decades. It takes time for the farmers to keep testing before the right seedlings appear again. Katie Chik Hiu-lai (right), conservation manager of the Conservancy Association, said it is possible that growing rice could become a sustainable way at least in the nearby community. She said the demand for organic rice grown in Long Valley has been increasing.